Family, food, friends, football games, marathons, visiting and having fun. Whatever you may be doing today, I wish you a most happy Thanksgiving. When you stop and think about all that you have to be thankful for, think about all those people so less fortunate in this world. Sharing what we have with others is never wrong, especially if it’s food and it’s given from the heart. I’m taking a break from the kitchen for a few days, and just chillin’. Hope you do the same. Be back again on Monday, folks! This recipe is for anyone who is not planning on roasting a whole turkey for Thanksgiving, yet wants to have some turkey the day of…just not for a week afterward. Can I interest you in turkey tenderloins stuffed with a savory filling of butternut squash, cranberries, sage and pecans? All the tastes of Thanksgiving wrapped up in a neat little edible package. These are not hard to make, they taste fabulous and even the next day, they still taste great leftover for lunch. Turkey tenderloins are the tender long strip of white meat hidden under the turkey breast. They are succulent, and so excellent for fast cooking. Because they are so lean you want to be sure you don’t overcook them or the meat will be dry. Once stuffed they are seared a little to brown them up, then covered and baked in the oven to finish cooking. By covering the pan you keep all the moisture inside, thereby maintaining moisture in the meat. I made these for Mr. D. and me as a pre-Thanksgiving meal to try them out, but they would be good anytime you want just a small amount of turkey or you’re planning a meal for a special occasion. 1. Heat a large skillet over medium-high heat and add olive oil. Add shallots and garlic and sauté over medium heat for 4-5 minutes, or until soft and golden. Sauté shallots and garlic till soft. Add butternut squash, cranberries, maple syrup and 1 Tbsp. water and cover; cook on low for 10 minutes. Add b-nut squash, cranberries, maple syrup and water. Turn off heat and add salt, pepper and sage. Stir in the pecans and set aside to cool slightly. 2. Cut a pocket into the sides of the tenderloins, being careful not to cut all the way through at the ends. Sprinkle inside and out with salt. 3. Stuff each turkey breast with about 1/2 cup of squash mixture. (This really depends on the size of your tenderloins. Stuff them as full as possible.) Cut cooking twine long enough to tie each breast with 3 to 4 pieces of twine. Cut off extra “tails”. 4. Preheat oven to 375*F. Wipe out the skillet you’ve previously used and reheat to medium-high. Spray with a little cooking spray. Carefully sear each turkey tenderloin on each side. If your skillet is oven proof, cover tightly with foil and place in the oven and bake for 25 to 30 minutes. (If your skillet is not oven proof, transfer the tenderloins to a baking dish and cover with foil.) Allow to sit for 5 minutes before serving. Thanksgiving has always been one of my favorite holidays. It’s a day that revolves around family and food; a time to think about all the blessings in our lives and to remember all the things for which we are thankful. The menu that gets served for Thanksgiving dinner is pretty traditional. Although I like to get creative, Thanksgiving is not the time when I want to have dishes on the table that contain unrecognizable ingredients. Sweet potato generally is not a vegetable that my family serves, although once in a while we do have a small bowl of them mashed. This year however, I am making a baked casserole in the Southern tradition. I auditioned it in advance to see how it would come out before springing it on my family. It passed the test big time!! Mr. D. pronounced it “fantastic”. This is not the usual sweet potato casserole with marshmallows melted and toasty on top. This one has a crumb topping with pecans in it. It is so yummy, I would be happy eating it for dessert. I think this dish is about to become one of our new traditions….. Please note: in the pictures that follow, the quantities you see are reduced from the recipe as I made a smaller version using only 2 large sweet potatoes. 4 pounds sweet potatoes (about 4 – 5 large), peeled and cut into 1-inch cubes. Cut up sweet potatoes into small(ish) cubes. 1. Put sweet potatoes in a large saucepan with water to cover. Bring to a boil, and cook over medium heat until tender, about 25 minutes. Drain and mash with a potato masher. Add 4 Tablespoons butter to hot potatoes and allow it to melt while you prepare the egg mixture. Add butter to hot potatoes so it can melt in, then mash. 2. 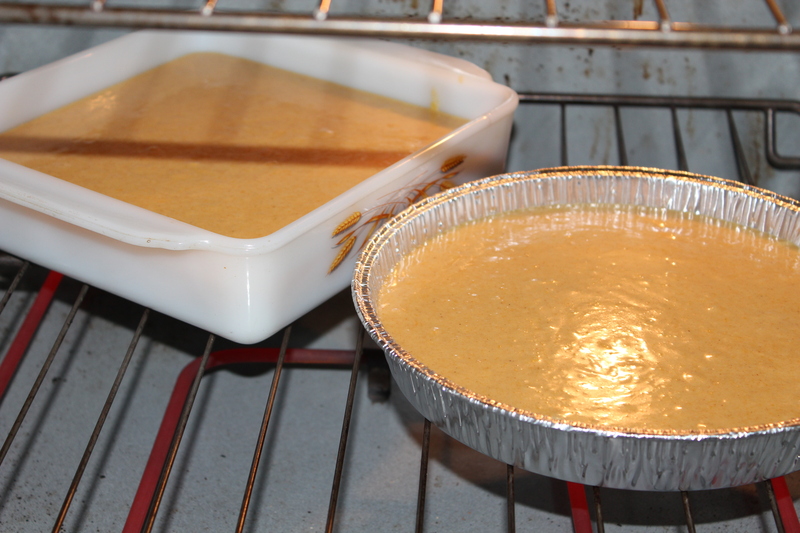 Preheat oven to 350*F. Coat a 13 x 9-inch baking dish ( or similar size) with cooking spray and set aside. 3. 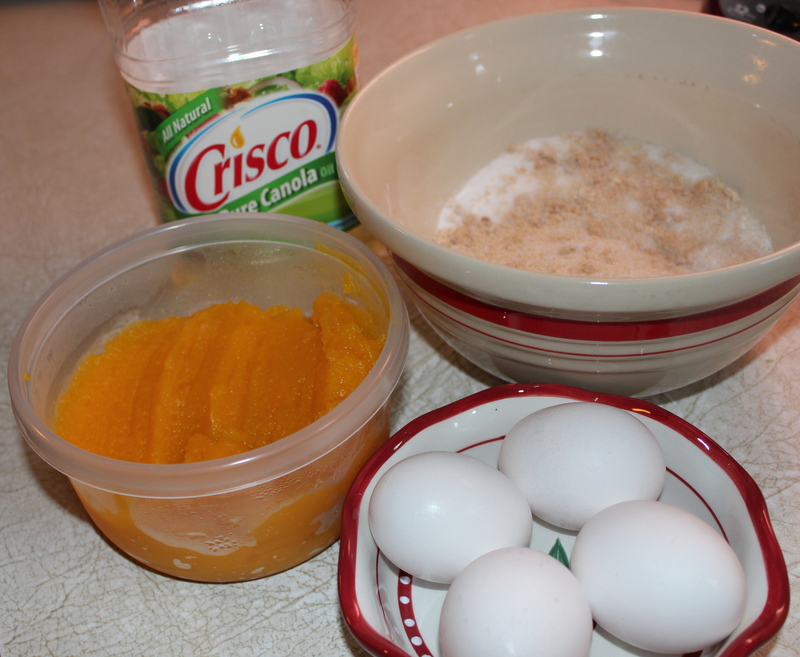 In a large bowl, mix together white sugar, eggs, salt, milk, and vanilla until smooth. Add to mashed sweet potatoes and stir well to blend smooth. 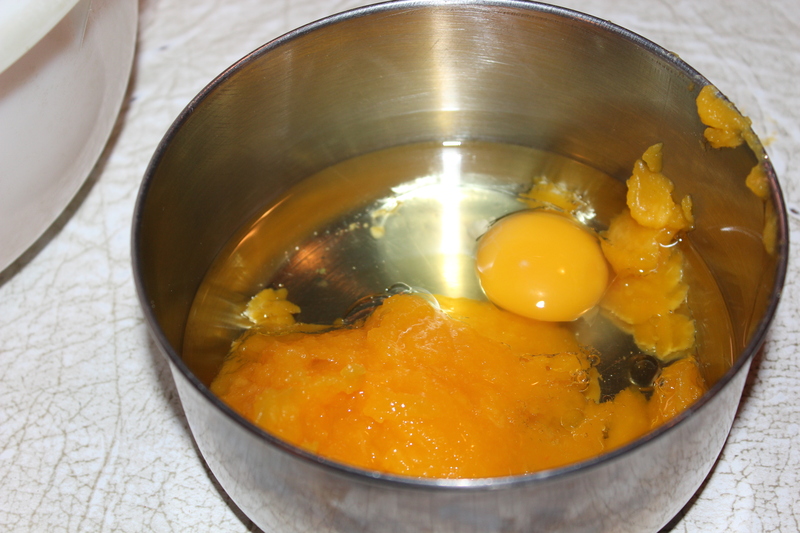 Add milk/egg mixture to sweet potatoes and blend well. 4. 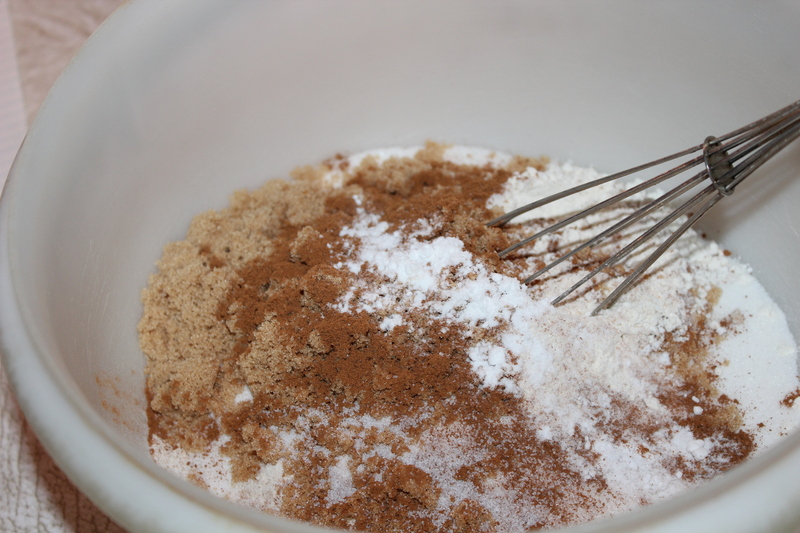 In a small bowl, mix brown sugar and flour. Add remaining 2 tablespoons butter and cut in with a pastry cutter or two knives until mixture looks like coarse sand. Stir in pecan pieces. Sprinkle over sweet potato mixture. Sprinkle topping over sweet potato mixture. Note: if you are making this ahead, cover it with foil and put in the fridge at this point. Then uncover it, put it in the oven, and bake it on Thanksgiving day. Or you can bake it in advance and just reheat it when you want to serve it. 5. Bake for 45 – 50 minutes, or until mixture is heated through and topping is lightly browned. On this day when we stop to appreciate and give thanks for all that we have I want to send a message of Thanks to my readers and friends for their continued interest and loyalty in reading what I have to say about food and its preparation. Without all of you out there I would just be throwing my words to the wind, but knowing you are there, reading and often times responding to my posts, keeps me fresh and interested in this pastime of mine. 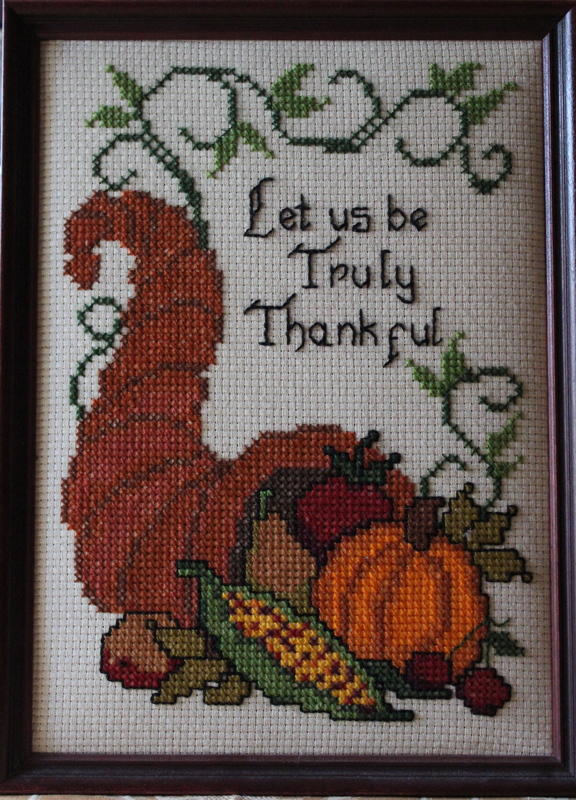 My heartfelt thanks go out to you and may you and your loved ones Have A Happy Thanksgiving! 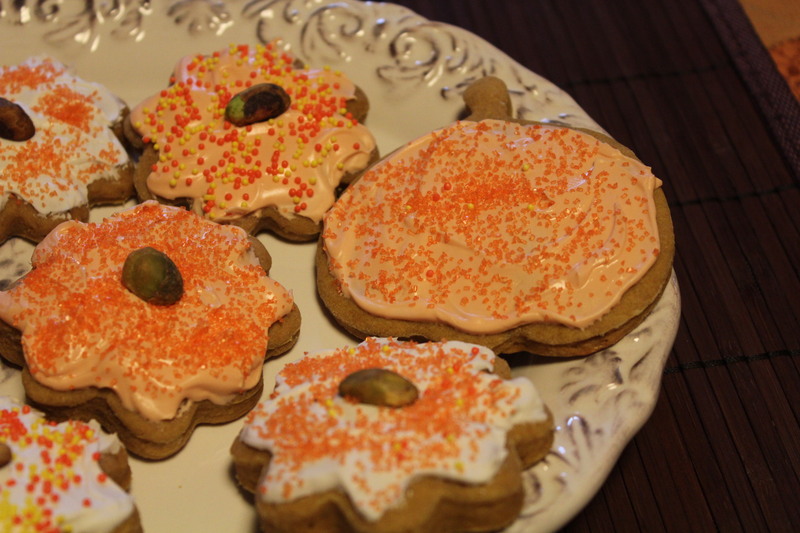 These cookies share one of the traditional flavors of Fall and Thanksgiving: sweet potatoes. I like to make them for any children who may be at my Thanksgiving Table, as not all of them like pie, preferring ice cream and cookies instead. 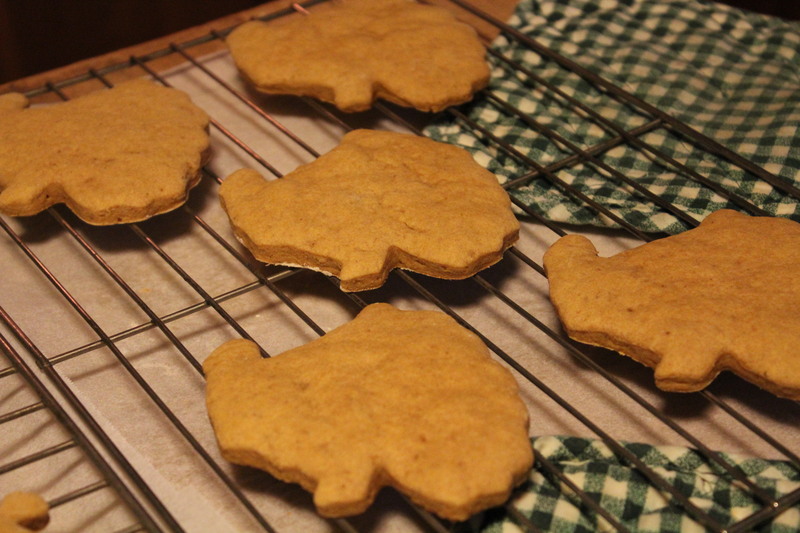 This year I have added two new cookie cutters to my collection; a turkey and a pumpkin, and I wanted to try them out, and since I am cooking sweet potatoes for a side dish, the small amount needed for this recipe allows me to make two things at once. I like that! These cookies are a kind of takeoff on the traditional Thanksgiving casserole of Baked Sweet Potatoes with Marshmallow Topping. I have made some minor adaptations to make them less sweet, and don’t usually frost them with the Marshmallow Frosting, but if calories are not a concern by all means top the cookies with the frosting. You may also brush the tops with a little egg white before baking, sprinkle with sugar and add a pecan or other piece of nut to garnish them. What I did for the cookies pictured here is make an Ornamental frosting with egg white, confectioners’ sugar, and a little vanilla. 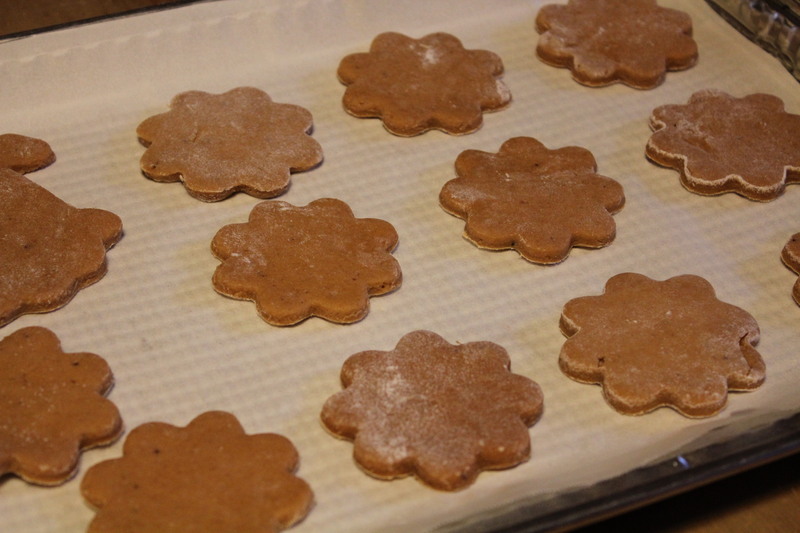 Then lightly frost them, like a glaze, and sprinkle with decorative sugar. They are not a sweet cookie so they can take a small amount of frosting. Children will like them for the shapes, and the frosting, not realizing they are getting some good nutrition from the sweet potatoes. I haven’t tried it yet, but I think you could make them with pumpkin instead of sweet potatoes, since both are so similar as to be interchangeable . Marshmallow Frosting, (optional.) Recipe follows. 1. Combine the flour, baking powder, salt, cinnamon, ginger and pepper in a medium bowl; set aside. 2. Cream the butter and brown sugar until light and fluffy. Add the egg and sweet potato and beat well. 3. Add the flour mixture and blend well. Form the dough into a flat disk, cover with plastic wrap, and refrigerate for 30 minutes. 4. Preheat the oven to 325 degrees. Grease 2 cookie sheets or line with parchment paper. 5. Roll the dough out on a floured work surface to 3/8 inch thick. Cut with a 3-inch cookie cutter. 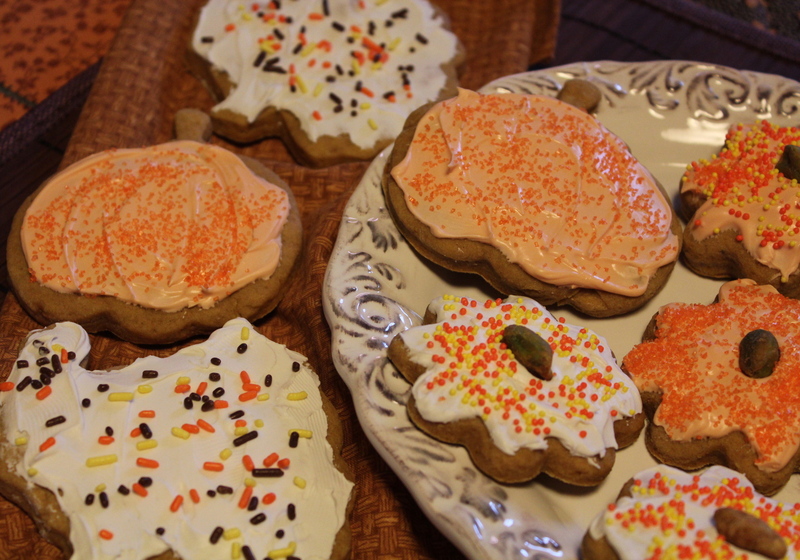 Place the shapes on the cookie sheets 2 inches apart. 6. Brush the cookies with the egg white mixture, and press a nut piece into the center of each cookie. 7. Bake for 15 – 18 minutes, until lightly browned. Let cool on the pans for 5 minutes, then transfer to cooling racks to finish cooling. 1. In a saucepan over medium-low heat, heat the milk and sugar for 6 minutes without stirring. 2. In a double boiler heat the marshmallows. When they are very soft add boiling water, stirring until smooth. 3. Remove from heat. Add the vanilla. With an electric mixer on medium speed beat in the hot sugar, keep beating until partly cool. Use at once. Pretty and Inviting. 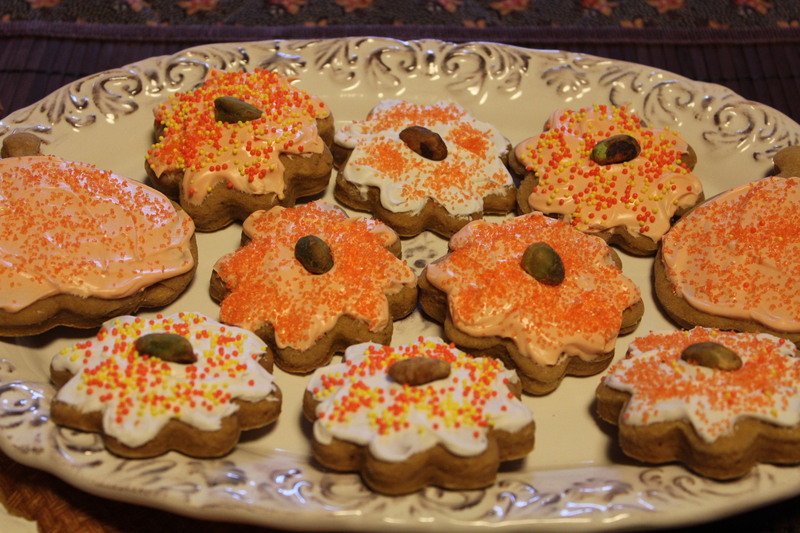 Garnished with a pistachio nut and decorative sugars. I’ve just eaten one warm from the oven..I was patient just long enough to photograph them and then I HAD to have one. Oh,Boy, are they good! 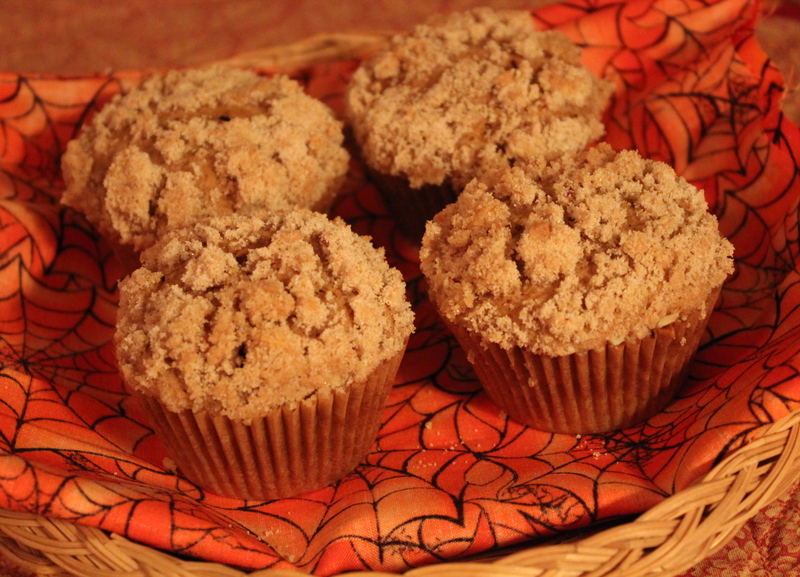 Fall spices, apple and pumpkin married together, not too sweet, a tender crumb, and a crunchy crumb topping. What else could you do to these to make them any better? I think these are perfect anytime you want to have one. At breakfast with coffee? Mid-morning coffee break? For Lunch with yogurt or cottage cheese perhaps? For dessert after dinner—as I said, anytime at all. 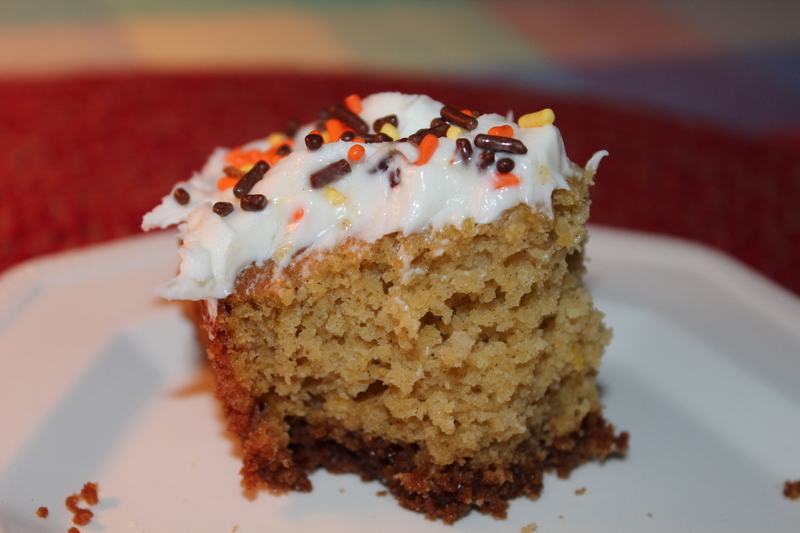 You must make these now, before there’s no more pumpkin left on the store shelves. You’ll be sorry if you don’t. The recipe makes a batch of 18 muffins. 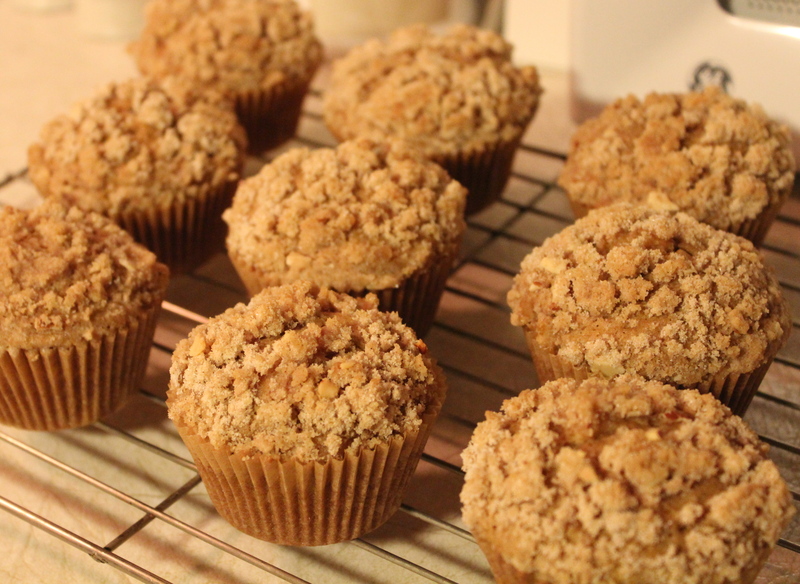 I thought that was a lot for just two of us, so I made half a recipe and got nine muffins. Now I wish I had made the whole thing and froze some. Guess I’ll just have to make more to have on hand for Thanksgiving morning. 1. Preheat oven to 350 degrees. Lightly grease 18 muffin cups, or line with paper liners. 4. Add wet ingredients to dry ingredients and mix just to moisten. Fold in apples. Mix everything together. Fold in chopped apple. 5. Fill muffin cups about 3/4 full. 6. 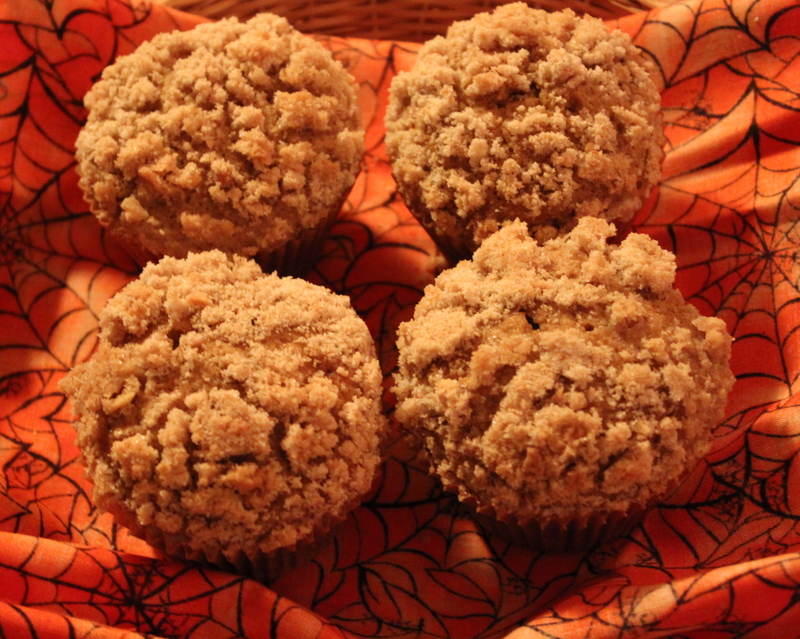 Mix together the streusel ingredients to form coarse crumbs, and sprinkle on batter. Pat lightly to adhere. 7. Bake at 350 degrees for 35 – 40 minutes. Test for doneness with a toothpick. Cool slightly in pans and then transfer to cooling racks to cool completely. Ha! if you can wait that long! 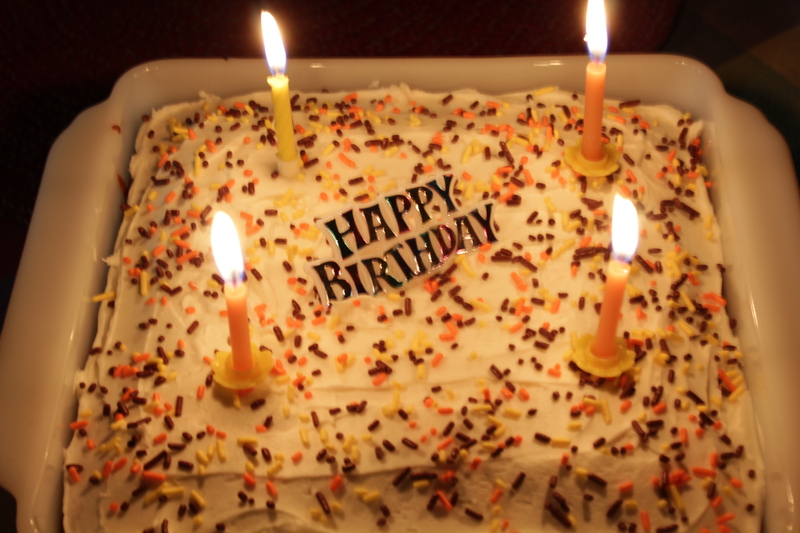 Using some of the pumpkin I cooked and pureed myself, I made this cake for my husband’s birthday. Although the title of the recipe is ordinary this cake is anything but. From the bottom up to the top there is something extraordinary going on. My recipe card for this cake has a smily face sticker on it and the words, “exceptionally good” to remind me of how much we and others like this cake whenever I make it. It is tried and true, and always dependable. One year, several years back, I made it for my husband to take to work for a pot-luck luncheon at Thanksgiving, and ever since I get requests for “that good cake”. One of his co-workers has since ordered one from me each year for Thanksgiving. So I am confident when I say “it will come out good, and you will like it”. 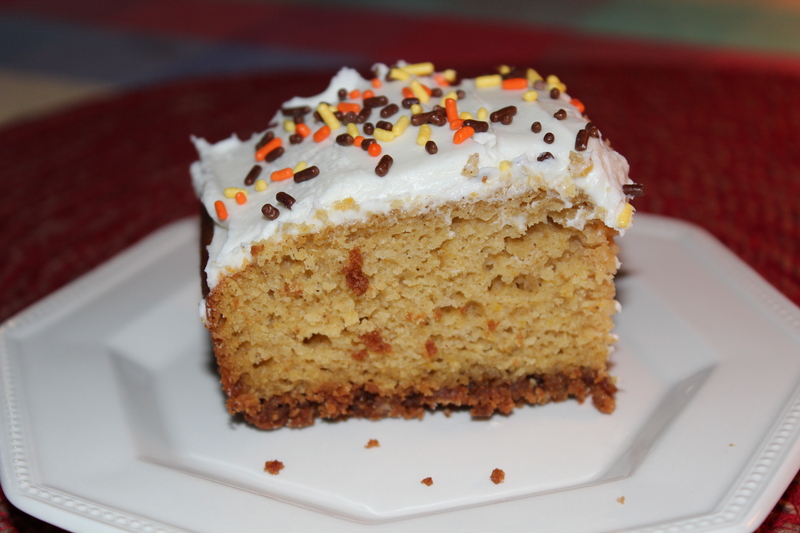 The bottom-most layer of the cake is a crumb crust. The recipe specifies graham cracker crumbs, but we here have an allergic reaction to graham crumbs, so I substituted ginger snap crumbs instead. 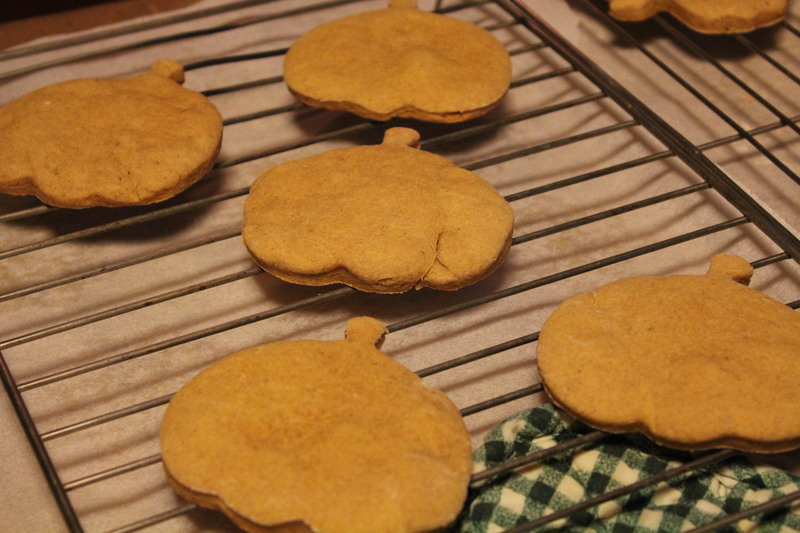 Now I always make it that way; ginger snaps just seem to go so much better with pumpkin. The cake layer is a pumpkin spice cake, and I have played around with changing some of the quantities and ratios, but it always comes out good. The frosting is a cream cheese frosting. Who doesn’t like that? 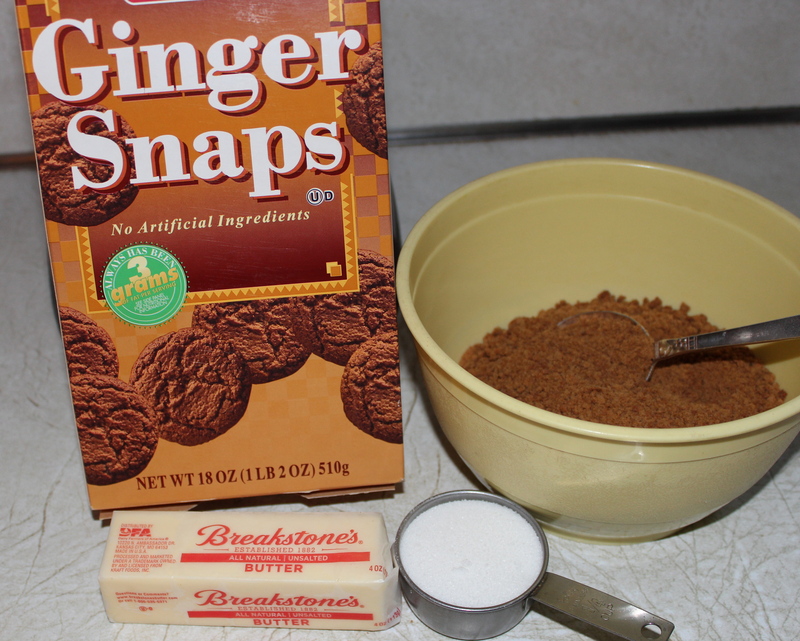 2 cups graham cracker crumbs or ginger snap crumbs. One sleeve of ginger snaps, pulsed in a processor makes about 2 cups. Mix all these together for the base. Press into the bottom of baking pan or pans of choice. Bake 5-6 minutes. Let cool. 1 cup vegetable oil. I use 1/2 cup and it comes out fine. 1. Mix the first 4 ingredients together with a whisk. 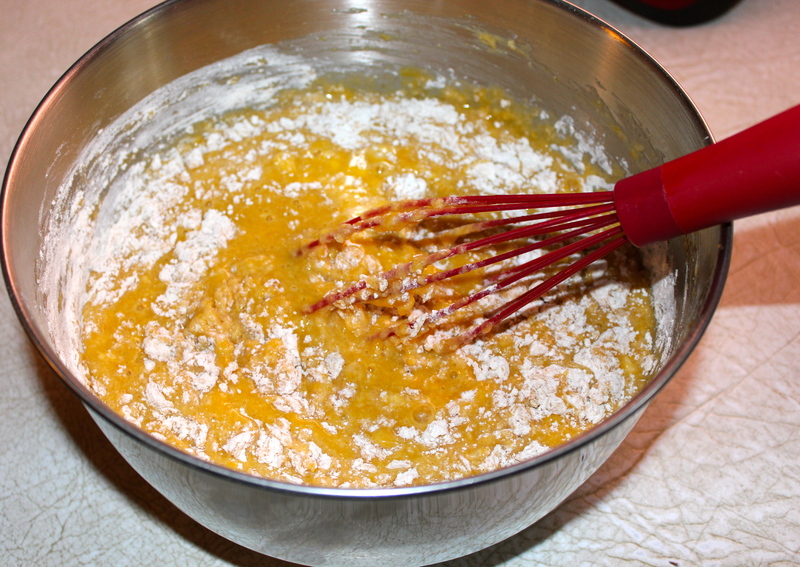 Mix wet ingredients together with a whisk. 3. 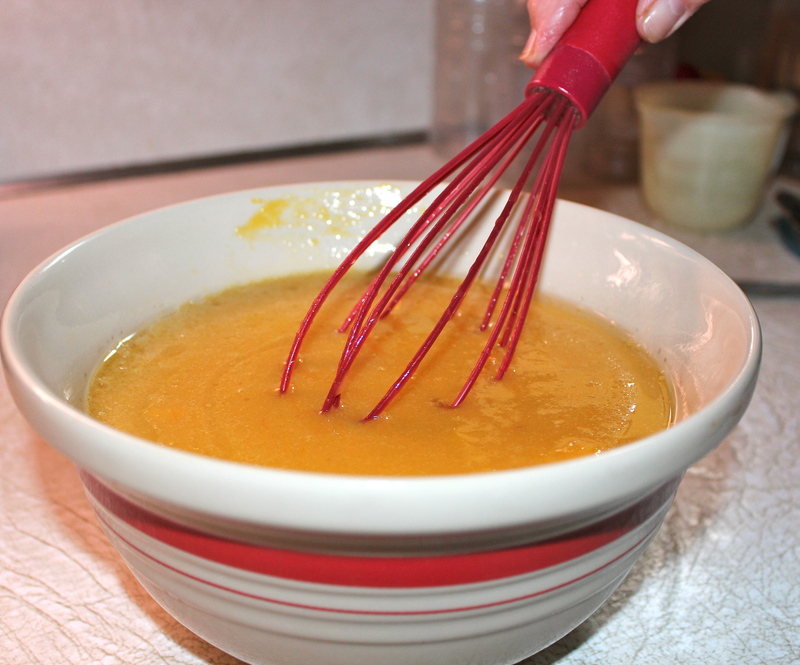 Combine the wet and dry ingredients with a whisk. Blend them well, but do not over mix. 4. Pour over the crust. 5. Bake at 350 degrees for 25 – 30 minutes. Test for doneness with a toothpick. 6. 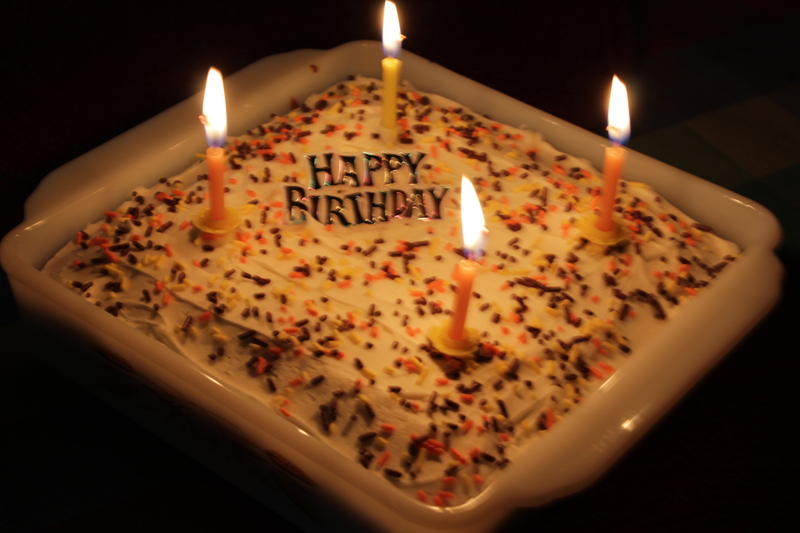 Cool completely then frost with cream cheese frosting and decorate as desired. In a bowl, with an electric mixer on medium speed, beat the cream cheese, butter and vanilla together until light and fluffy, about 2 minutes. 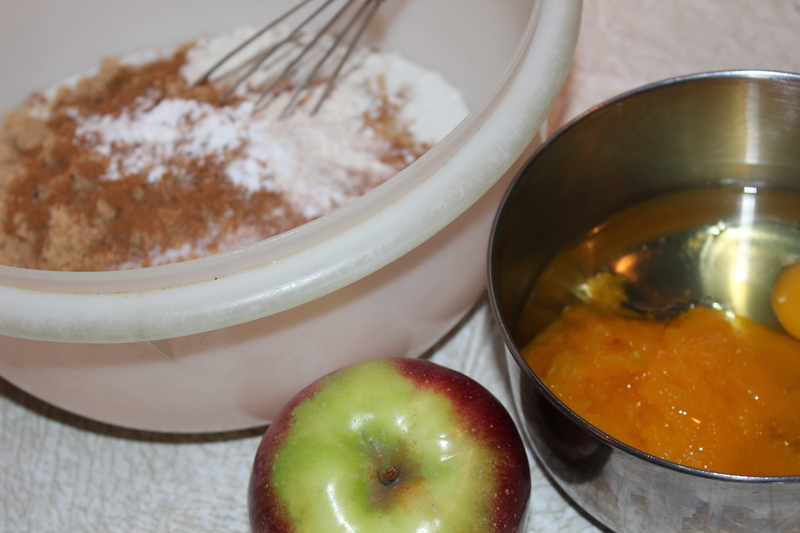 Gradually beat in the sugar and mix thoroughly, scraping down the sides of the bowl as needed. If the consistency is too stiff, thin with a drizzle of milk or cream. If it is too soft, refrigerate until frosting is spreadable, about 15 minutes. This is my husband’s half-eaten piece. He couldn’t wait for me to photograph it!